The Daily News of Open Water Swimming: Who Would Have Guessed? Courtesy of Lewis Pugh Foundation, South Georgia in the Southern Ocean. "I hate swimming in ice cold water," said Lewis Pugh who frequently swims in water at, near or below 0°C in the Southern Ocean near Antarctica. The lawyer-turned-ocean advocate, author and speaker does his incredibly dramatic expeditions in order to gain public awareness and political assistance in calling attention to the protection of the oceans and its marine life. But it is not only the colder waters of the North and South Poles where he is exclusively interested. He recently tweeted about the Mexican government's creation of a national park and the largest marine protected area in North America in the Mexican Pacific area known as Revillagigedo where there are 366 species of fish, 37 shark and ray species, 4 types of sea turtles, and humpback whales live. 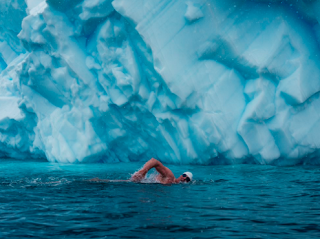 To follow Pugh and his adventures, campaigns and interests, visit @lewispugh.